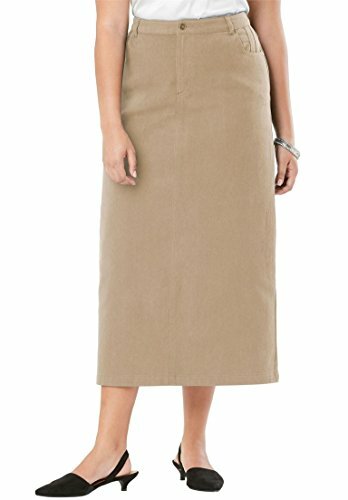 Our favorite color-rich plus size longskirtin classic cotton denim and twill. The long length is a chic modern look ideal for the office, going out, or traveling. in a straight fit for a classic silhouette 34" length ends just above the ankle front rise sits slightly above the natural waist classic button-and-zip fly front close side pockets and two back patch pockets; belt loops cotton twill or denim machine wash; imported Long jean skirt in sizes 14, 16, 18, 20, 22, 24, 26, 28, 30, 32 Fit and Fashion Notes: This classic long skirt is available in an array of colors that stay true and don't fade wash after wash. Why We Love It: Our customers are impressed with the high quality and true-to-size fit of this beautiful long jean skirt. They love its sophisticated straight cut, saying it gives them an iconic look that serves them well both at work and for casual occasions. If you have any questions about this product by Jessica London, contact us by completing and submitting the form below. If you are looking for a specif part number, please include it with your message.